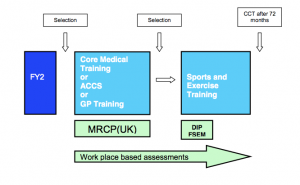 How do I become a Sport and Exercise Medicine Specialist? Sport and Exercise Medicine doctors need a wide range of clinical skills and a good understanding of human motivation. A flexible approach and the ability to work as part of a multidisciplinary team will get you off the starting blocks if you are interested in a career in Sport and Exercise Medicine. The following will take you through the pathway for Higher Specialty Training (HST) in Sport and Exercise Medicine. Once you have completed one of the above, apply for a Specialist Training post in Sport and Exercise Medicine at ST3 level. Sport and Exercise Medicine Higher Specialty Training takes 4 years. By ST5 the trainee must have completed the FSEM (UK) Membership Exam in SEM. Once you have completed Specialist Training and gain a Certificate of Completion of Training (CCT), as a Consultant, you can join the GMC specialist register and become a Fellow of the Faculty of Sport and Exercise Medicine UK. Further information about the specialty and the application process can be found on the JRCPTB specialty overview page. The FSEM oversees the curriculum for HST in Sport and Exercise Medicine, and the FSEM (UK) Membership Exam is based on this curriculum. Candidates are highly recommended to become familiar with the SEM curriculum on the JRCPTB website. The FSEM (UK) Membership Exam in Sport and Exercise Medicine is the path to Membership and Fellowship of the FSEM (UK), however doctors interested in SEM may wish to complete a postgraduate course first and can find information on our other courses page.